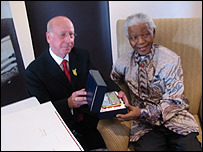 Football legend Sir Bobby Charlton has wished Nelson Mandela and South Africa well as the country prepares to host the 2010 World Cup. Members of the Manchester United squad with Sir Bobby and manager Sir Alex Ferguson met the former president in Johannesburg on Wednesday. The team is in South Africa for a series of games against local clubs. 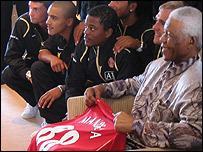 Mr Mandela, who celebrated his 88th birthday on Tuesday, was presented with a "Mandela 88" jersey. "I hope the World Cup will be a major success - and everyone will be very glad to see you present the trophy to the winner," Sir Bobby said, as he gave Mr Mandela a mounted photograph of Manchester United's Old Trafford home stadium. If [the team] had his values and his strength and his philosophy they won't go far wrong. The team also gave the former president a limited edition history of the club, and members of the squad were individually introduced to Mr Mandela. "I am meeting many of you for the first time, but I see familiar faces," he said. The team's most familiar faces were absent, however, as they were resting after the World Cup in Germany. Sir Bobby told the BBC that the team had had a "very successful" visit to South Africa. "People enjoyed the great football that was played. It was marvellous. "The team has a lot of fans in South Africa and it was good to get the opportunity to come and play here." He said the squad had much to learn from someone like Nelson Mandela. "If they had his values and his strength and his philosophy they won't go far wrong."